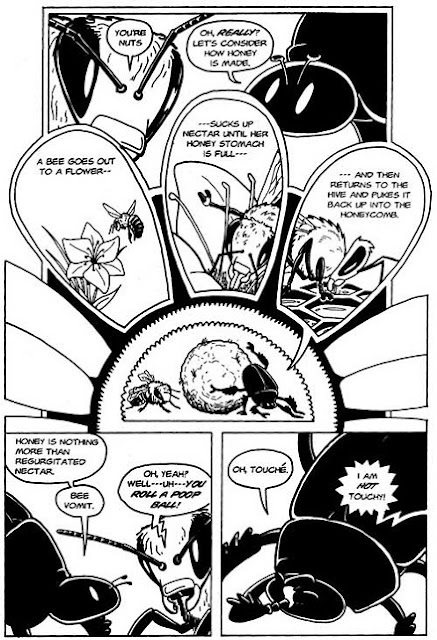 Jay Hosler's acclaimed graphic novel Clan Apis follows honeybee protagonist Nyuki on her journey through metamorphosis. I attended cooking school. A highlight of every day at Cook Street was the critique. After every meal, from amuse bouche through dessert, every course was critiqued by the class. What was good, what wasn't good. What looked good but tasted not so good. For a chef-in-the-making, the critique is an important part of the learning process. You learn what works or doesn't work. You learn what people like or don't like. You learn how to earn repeat customers and you learn how to lose business. I always found it hard to give a critique, not just because I'm soft-spoken but because some people - usually the chef preparer - would take it personally and become defensive. To give an honest critique I had to choose my words carefully. Others were not so careful and Chef Ryan, the school's Sous, had to remind folks that, "You are not the food." I never really understood that. Until today. Fast-forward from my life as a culinary student to studier of bees. I'm looking at my newly purchased $44 hivetop feeder that is leaking. I am trying to be very Buddhist and not say bad things about the maker of said feeder, but the feeder arrived with instructions to apply a very specific urethane prior to use, and $12 later I still can't use it. My first email was, "Hey the feeder is leaking, what do I do?" The reply was to go and get another specific product to glue the cracked wood, then to properly seal the feeder. Not keen on a trip to the hardware store to spend another $6 so I could fix the leaking feeder myself, I wrote back that I was skeptical that a glue & re-sealant fix would last in the long run, and that I wanted to exchange it instead. I'd read the policy posted on their website and it was reasonable. "You are not the wood!" I want to tell him. But I think he's just one of those high-blood-pressure curmudgeon kind of people that I don't have time for. I'm moving on. If I ever need another Warré hive, I'll just buy it from another store. Although after reading Anaiis Salles' Bee Green Philly post, I'm wondering where that might be. 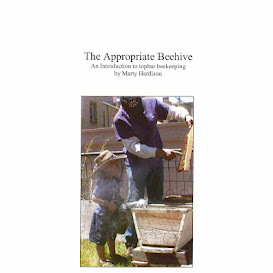 The beekeeping supply store in Denver sells hives but they don't sell parts or accessories, and that's a whole 'nother bee in my bonnet right there. I need to count to ten. The word "skeptical" is pretty bland. Perhaps he is selling subpar feeders to customers around the country and now is tired of hearing about it. @Rusty I could very well have been the straw that broke the curmudgeon's back. I pitched his email but it started off something like, "When customers write that they're skeptical..." and then it just got unpleasant. I wish I had skills like you, and a place to store all the tools, so I could make my own equipment. Ah, the suburbs.